We explore textile sensors for dance costumes. We developed an interactive dance costume to better understand the rare use of technology in dance costumes and to learn about the difficulties of integrating technology, such as Lily Pad Arduino and sensors into dance costumes. After a research phase, in which we analyzed the properties of different sensors according to their possible use in dance, we conducted an iteration process, in which we developed prototypes of the costume. The first prototype of the costume was worn by dancers who then gave us feedback concerning wearability, functionality and use of the garment. In the end, a different dancer wore the improved costume and was giving us feedback on the same matters. The final costume consists of an ultrasonic sensor to measure the distance from the dancer to an object, 6 Neopixel strips to represent the measured distance in form of a light output and a Lily Pad Arduino to process the data. The evaluation method we used, was a semi-structured interview. The costume consists of a big hood and a shoulder and back covering fabric, so that it would fit many sizes. It is fixed with a belt around the hip of the dancer, so that it does not move around the dancers body during the performance. The golden chain around the hip is ornament. The Neopixel chains are sewn onto the solid base fabric and covered with a see-through one so that the light would spread more and the circuit parts would be better hidden. 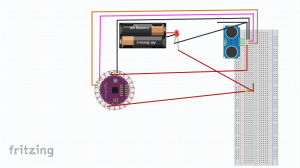 The sensor in the back is sewn into a cotton filled tube, that resembles an exaggerated spine, where also the LilyPad Arduino, the cables and the battery pack are hidden. The cotton prevents the technological parts from damage and from shifting inside the costume. 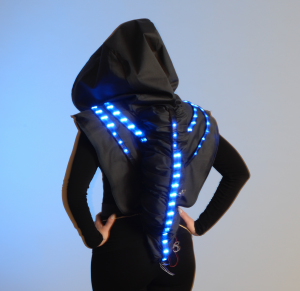 The Neopixel chains exit the back part and wrap around the dancers shoulders. // Calculate the distance (in cm) based on the speed of sound. The following video shows an example dance performance using the costume. To find out why computational components are rarely used in dance, we developed an interactive dance costume to fit an existing choreography. 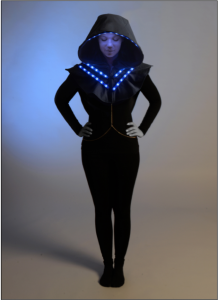 The costume detects objects and persons and shows the distance as a light output, activating a varying amount of Neopixels on six strips on the costume proportional to the measured distance to the object or person. While testing it on a third dancer, who did not perform the choreography, it turned out that it was possible to use the costume for another choreography, than the one it was made for. In conclusion, we consider the costume applicable for many different dance performances, which is why we conclude, that the lack of technology in dance performances is possibly not caused by an impossible construction of a garment, which is adaptable to different performances. Still the issue of instability causes problems for a permanent use on stage. As we have seen with the first prototype, the circuits or sensors can easily break any time and cause unwanted effects during the performance. As our study did not include research on how often the costume can be washed, we cannot be sure, the costume can be used for a long time. In our interview with the dancers, we found out, that rehearsal times might get longer using an interactive costume, as the dancer probably needs time to get used to the feeling that he could break anything and has time to learn to adapt on possible modifications on a choreography, because of the constraints in movements that an electronic system can imply. In future research, it could be interesting how much more time for rehearsals would be needed exactly. This could be a reason for the rare use of technical features in dance costumes, as professional dance theaters usually have tight and fixed times for rehearsals, where nearly no flexibility is allowed.